Social media has been the focus of a growing body of research in the past few years. In the social sciences and humanities, a corpus of critical work is building around themes as diverse as usage patterns, impacts on cultural production, ethics, privacy and surveillance (see here and here for examples). Outside the academy, research by consultants, PR and marketing firms, independent analysts and “embedded scholars” has explored how a range of individuals and groups (Canadian MPs; CEOs; celebrities; nonprofit organizations; etc.) are using social media, and the burning question of whether your organization—government, corporate, nonprofit—is ready to launch a YouTube campaign, set up a Facebook Fan Page or jump into the Twitterverse. Largely ignored in this body of articles, white papers, briefs and reports, are examinations about the impacts of social media within higher education, especially with respect to how academics are using these technologies in their research and teaching. Academics are an important demographic for consideration because, arguably, we are the ones most directly in contact with the teens and twenty-somethings whose lives are increasingly shaped and defined by social media ubiquity. Not only do we have a privileged vantage point for observing and understanding how students use social media, but we are also positioned to teach them how best to utilize the means of information available so they may engage in reflective thought and discussion. This has always applied to Chaucer, Marx and Pasteur. It should apply to Twitter, Wikipedia and Facebook as well. According to a report published in the Huffington Post, 80 percent of university and college professors, particularly those in the social sciences and humanities, are using social media in their research and teaching. My immediate reaction was surprise. Drawing on my own experience as an active social media user and professor in a middle-range Canadian university, my observations of my colleagues’ social media practices falls well short of the impressive numbers in the Huff Post headline. Granted, several have a Facebook account, which they mostly use to keep in touch with family and friends, or to post photos and share links to news stories. Many of them also use YouTube videos for illustrative purposes (as my own profs did with film or television recorded on VHS tapes). But I can count on one hand the number who maintain or regularly visit a blog, who use Twitter for research or networking, or have even heard about Chatroulette or Foursquare. a) Approximately 10,000 surveys were distributed to Pearson customers with fewer than 1,000 surveys completed. A 9.5% response rate does not in itself fall outside the norm for online surveys, yet the possibility of a selection bias remains because we unfortunately know nothing about the sampling strategy. If, for example, the subject line of the recruitment letter said “Faculty Social Media Use Survey,” non-users would almost certainly opt out of participation. Active social media users, dabblers and the curious would be more likely to respond, thus explaining the finding that 80% of faculty are using social media. The Slideshare file (linked above) provides only the thinnest information about the study’s sampling strategy. Without knowing more about how the survey was distributed, or the efforts taken to ensure balance in the results, we are in a weak position to assess the quality of the research. 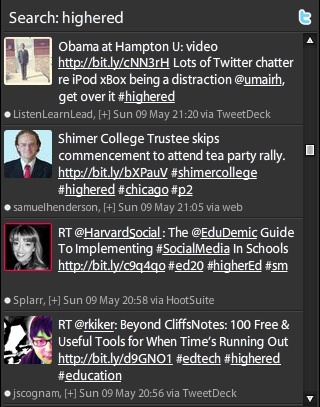 b) Similarly, the study reports that 38% of respondents teach online courses—these courses would almost certainly have a class blog for discussion, Slideshare presentations in lieu of lectures, or embedded video and podcasts to make course material more interesting (all of these are defined in the study as examples of “social media”). In any case, one can legitimately ask whether the results might have been influenced by an oversampling of faculty who may already use these technologies by virtue of the types of courses they teach. The study reports that 71% of respondents have watched an online video or listened to a podcast (how frequently or in what context remains a complete mystery – does downloading the latest episode of The Age of Persuasion to my iPod count?). It also notes that barely 20% of survey respondents use YouTube in their teaching and hardly any actually communicate with their students via Facebook (12%) or Twitter (3%). Although a slightly larger number of respondents report using Skype to communicate with colleagues, it’s questionable whether their use of VoIP extends beyond its most basic phone-like functionalities. A surprising finding from the study is that a professor’s age or years of experience did not appear to determine their social media use. With the exception of “creating a video/podcast”, the survey respondents reported using social media applications overwhelmingly for personal rather than professional purposes. And while respondents report seeing some value in using video, podcast and blogs for classroom instruction, the vast majority of them judge social networking platforms (e.g. Twitter, Facebook) to be an unworthy tool for research, for collaboration or for teaching and learning. I encourage my students to assess research for the empirical and theoretical contributions they make. In other words, what is new about this study and why is it meaningful? The Pearson study is important because it attempts to fill a gap in knowledge about social media and the academy. I commend the authors for establishing a baseline upon which to build future research. Ultimately, however, the study falls short on both empirical and theoretical fronts. Empirically, it doesn’t actually tell us anything groundbreaking. What value is there in knowing that 90% of academics are passive social media users? Is it to inform the development of how learning technologies are introduced on campus, or to inform research that might explore how changes in media technology is altering the research, teaching and learning environments? A cynic (not me) might even question whether an academic publisher is motivated here by ulterior purposes. The important point is that the study doesn’t ask and it certainly doesn’t tell us why these data are interesting. It also does not explore what is arguably the more meaningful question: why are educators under-utilizing available technologies? Is it because they don’t understand what these platforms do? Is it because they are ambivalent about its use? Or, if a recent study by the Ontario Coalition of University Faculty Associations offers any insight to this question, is it because they are deeply suspicious about its value and threatened by what it does to their working environment? Theoretically, the study makes a very weak contribution. Most strikingly, it does not tease out what is actually social about these technologies. In one sense, it fails to provide a conceptualization of each technology, so we are left to conclude that Twitter=Facebook=Slideshare=Flickr=Skype. Each platform not only has different functionalities but they also enable and demand different modalities of user participation. It isn’t surprising that professors will look to YouTube as a video archive to assist with lecture preparation; but that doesn’t make their use of YouTube “social”. Professors have used video to enhance their teaching for as long as portable video technology has been available. All this study tells us is that academics are probably treating YouTube more as a content container than a content sharing platform. The fact that so few college and university faculty are using new technologies to communicate the results of their work (what we have now begun to call ‘knowledge transfer’), to network with other scholars, or to share and co-generate new ideas with their students, leads me to conclude that very little has actually changed with respect to why professors use media technology. Ultimately, it’s this pattern of under-utilization that for me is most theoretically interesting. The Pearson study, in placing its emphasis on the headline-grabbing 80% figure, misses this point entirely. Pearson has offered scholars and practitioners an opportunity to begin an interesting discussion about how social media is transforming our institutions of research and higher learning. There are important research opportunities, policy questions and pedagogical discussions to be had. I propose that we explore these issues more fully and move away from chasing headlines.